I know somebody who only buys the first LP or CD of artists he likes. And if he really likes them,he sometimes buys the greatest hits compilation, if that exists. The reason for this is that he has been disappointed too many times by second and third releases. I know that disappointment all too well, but I can’t help myself. So in my collection there are many second, third and further releases by bands of which I only play their first LP/CD. My friend (his name is Henri) is right: there is enough music made on this planet to limit your collection down to first releases. And it makes his collection far more interesting than mine! 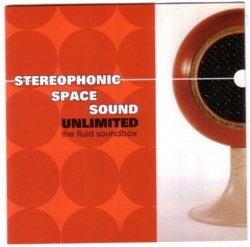 I just listened to the fragments that Amazon offers of the third CD by Stereophonic Space Sound Unlimited, The Spacesound Effect. I have bought their first and second CD, but didn’t buy the third one, because I couldn’t hear the magic that Lost TV Themes has in my ears. Especially Space Mission Number 12 is one of my all time favs. 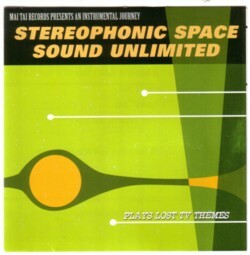 There are many bands that made compilations of fake TV tunes, but I think that this CD is one of the best. At least one of the best that I have heard. The music on The Fluid Soundbox and The Spacesound Effect is, at least in my ears, more of the same as what is on Lost TV themes . But less inspired. That is all I want to say about it, because I am a fan: I prefer not to write about things that I don’t really like. There is enough stuff that I do like and I never understood why people should write about things they do not like anyway. What I like about the music of this two man band (I didn’t know a thing about the band, but while searching for those Amazon fragments I read a few things. I will spare you that information!) is that they really came up with some tunes that sound as a theme of a sixties TV series. It is almost more than that: while listening to a song like Space Mission Number 12 , I can’t help thinking that this signal travels back in time and will inspire somebody in the 60’s to actually make this Space Mission Number 12 series. Somewhere in a parallel universe people like you and me (well, not like you and me, but you and me in a parallel version) are now watching the DVD with all the episodes of that series. And I bet it is a great show!